Yesterday’s passing of the legendary former North Carolina men’s basketball coach Dean Smith at the age of 83 was a huge loss to the sports community let alone society. It caused me to think back to when I first read his book The Carolina Way: Leadership Lessons from a life in Coaching and how the leadership lessons in that book molded me into the teacher and coach I am today. As a varsity soccer coach, I always look for books to read during the offseason that deal with practical ways to demonstrate leadership with my players and program. Smith’s book was filled with many practical lessons that he used with his teams as he stressed leadership and team building. Smith’s book was not only enjoyable to read because he shared many stories about players and teams he coached, but I really enjoyed the Coach Smith takes us through every aspect of his program, illustrating his insights with vivid stories. Accompanying each of Coach Smith’s major points is a “Player Perspective” from a former North Carolina basketball star that shows the strong influence Smith had on his players. Feeling a little nostalgic last night after watching countless remembrances about Coach Smith on television, I went to my bookshelf and found the copy of his book. As I began perusing the principles of leadership defined in The Carolina Way, I felt an obligation to share some leadership lessons as a tribute to one of the finest coaches of all-time in any sport. Coach Smith said the most important thing about being a good leader is showing you care. While he was a demanding coach, his players always knew he cared for them and that their relationship did not stop once the player left the program. 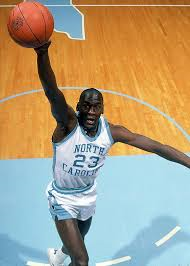 Former Tar Heel Phil Ford, once said, “I got a coach for four years, but a friend for life.” Another former Tar Heel and NBA great, Michael Jordan, said yesterday that other than his parents, Coach Smith had the biggest influence on his life. Parents whose sons played for Coach Smith must have felt so comfortable knowing their child was in great hands. A second leadership lesson Smith shared was to show a commitment to your players. It used to be automatic that coaches garnered respect from their players, but today’s generation is different. Players at the youth, high school, college, and even professional level often question authority. Smith stated that a leader’s job is to “develop committed followers” by showing your credibility as a coach. I believe this is easier said than done, but a crucial element to a coach’s leadership and respect from his players. Smith felt it was important to have an emphasis for each practice so players would understand the reasoning behind each task that day. A mistake a coach can make is to emphasize something, but not enforce it because now the emphasis has become counterproductive. As a coach myself, this is very difficult to do. I may go into practice with an emphasis on what we need to work on, but if it is not enforced throughout practice and upcoming days, that day’s practice is wasted. One of the biggest influences Coach Smith has had on me as a teacher and coach is the idea of servant leadership. He always tried to put himself in the shoes of his players to put their needs, growth, and development ahead of his own. By far, this is my strongest attribute I have when working with my students and players. As coaches, many times we get on our players for mistakes they make. However, Coach Smith said coaches must be a confidence builder and praise players for what they did well instead of what they did wrong. This often this gets lost during games as coaches are under pressure to win. Coach Smith said he was tougher on his players in practice than in games because games are when they needed the most confidence. What a great point this is for coaches to keep in mind. Players need coaches in their corner as they compete in games. Anyone who has ever been part of a team knows how important team building is to forming a foundation of success. Well, Coach Smith was a master at getting all of his players to understand their roles on the team and embracing them. Sure every player wants to start and play as much as possible, but Coach Smith had that unique ability to get his subs to embrace their role and support their teammates. As the season went on, Smith would find the time to sit down with all his players and discuss and clarify their roles. Every coach has the best of intentions and hopes to find the time to do that. What separates Coach Smith from many coaches is he found the time to meet with his players individually so they were all on the same page. In a way, Coach Smith ran his team like a boss runs his company. If the employees do not understand their roles and specific areas of responsibility, it would be very difficult for this company to be successful. Without a doubt, Coach Smith was a master at team building and having a cohesive unit. 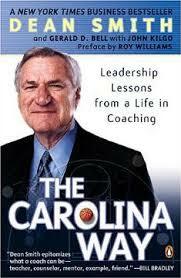 Under Coach Smith, senior leadership was an important element if the Tar Heels were to be successful. He felt it was the responsibility of the seniors to mentor the younger players and enforce the rules. By doing so, a strong group of upperclassmen come through the program and the ripple effect lasts from year to year. It’s no wonder Coach Smith retired with 879 victories which was the most victories for a coach at the NCAA level when he left the bench. We all know players will try to push the envelope with a coach to see their limits. The least enjoyable part of coaching is definitely discipline. No coach looks forward to it, but discipline is necessary if players are going to abide by the rules and respect the coach. Coach Smith showed no favoritism and punished every player the same- fairly and consistently. He knew each situation was different and needed to be examined differently. Yet, Coach Smith never had double standards for players based on talent and that is why he is beloved by his former players and their parents. 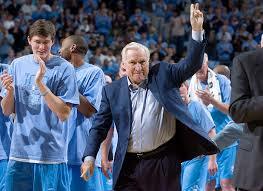 Under Coach Smith, Tar Heel players always demonstrated class. He always told his players, “A lion never roars after a kill.” In an age where a player like LA Clipper Chris Paul crosses over an opponent before scoring then stares down the opponent’s bench while his team is down 20, you gain a deeper appreciation for the class Dean Smith’s teams always displayed. One of my favorite stories I remember reading in this book was that Tar Heel players were to point at the player who passed him the ball after making a basket. Coach Smith stressed to his players that basketball is a team sport and that it was important to celebrate the player who assisted on the basket as much as his teammate who scored. What a class act! Despite 879 victories, Coach Smith always put winning in perspective. The wins were great, but Coach Smith “cared more about our getting a sound education and turning into good citizens than he did about winning,” said former Tar Heel Scott Williams. He always kept the bigger picture in mind and will forever be respected by his players, staff, other coaches, and those who followed his life and career. If you are looking for an outstanding book that further discusses leadership lessons from Coach Smith with stories directly from his coaching career, The Carolina Way: Leadership Lessons from a life in Coaching is a must read. I am sure Coach Smith and another former Tar Heel, the late Sports Center anchor Stuart Scott, are up in heaven wearing the Carolina powder blue and cheering the current team as they finish up ACC play and move on to March Madness. The basketball world lost a coaching icon in Dean Smith’s passing. Even after his retirement, Coach Smith bled Carolina blue. He will forever be a part of Tar Heel history as new players are recruited to Chapel Hill.